Wholesale Personalized Office Supplies Container -Caddy Custom Printed or Blank. Promotional, Inexpensive. Bulk custom imprinted large desk caddy filled with office supplies. We also supply wholesale blank (not imprinted) desk containers for $3.75 each. Budget Prices in USA and Canada for wholesale desk caddies with office supplies. American clients pay no taxes. The unit prices below include your 1-color custom imprint on one side. Blank desk caddies cost $3.75 each (minimum quantity: 100). You may order any quantity above the minimum. Production Time: 7-10 days after artwork approval; Rush production is available at extra cost: contact us. 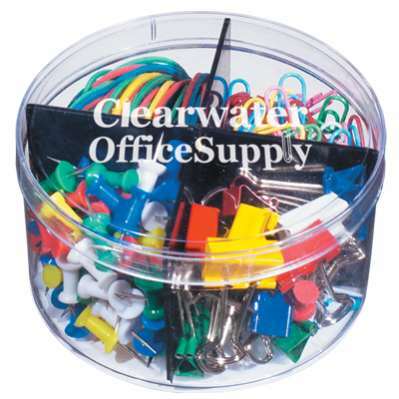 Holds 40 - 32 mm Colorful Rubber Bands, 100 Paper Clips, 80 Push Pins And 15 Binder Clips. MULTI-COLOR IMPRINT Add 0.30 per extra color, per piece.